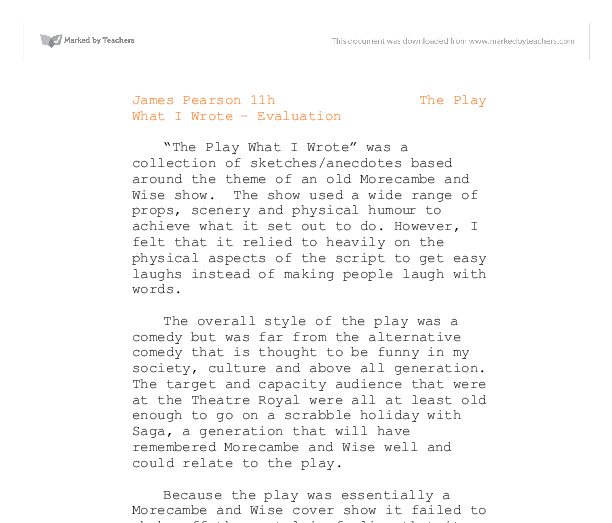 James Pearson 11h The Play What I Wrote - Evaluation "The Play What I Wrote" was a collection of sketches/anecdotes based around the theme of an old Morecambe and Wise show. The show used a wide range of props, scenery and physical humour to achieve what it set out to do. However, I felt that it relied to heavily on the physical aspects of the script to get easy laughs instead of making people laugh with words. The overall style of the play was a comedy but was far from the alternative comedy that is thought to be funny in my society, culture and above all generation. The target and capacity audience that were at the Theatre Royal were all at least old enough to go on a scrabble holiday with Saga, a generation that will have remembered Morecambe and Wise well and could relate to the play. Because the play was essentially a Morecambe and Wise cover show it failed to shake off the nostalgic feeling that it could've easily disguised. The actors were clearly very inspired by the famous comedy duo but this was far too evident throughout. ...read more. Comedy now is about observing everyday situations, laughing at ourselves and exaggerating possibilities into the surreal and unknown. Comedy should make you think and keep your brain active and unlock things in the back of your mind. Instead, "The Play What I Wrote" just gave it some candy floss to sit and get fat on, no signs of stretching the imagination or creativity. It is far more an achievement to get a capacity audience to split their sides by just one person and a microphone. There's no relying on physical comedy, silly props or cheap one-liners. The power of words is far more effective than that. We're living in the times of Billy Connolly shouting and swearing through riotous anecdotes and the surreal child-like world that Eddie Izzard creates around himself, totally turning the normal on it's head. I found it hard to follow what was going on half the time; the play didn't seem to make any progress for itself and was based around a poorly written script with a plot looser than a loose thing that's just graduated at the university of looseness with a 2:1 in being loose. ...read more. What's also suprising is the eagerness of so many big names to be involved in the show. Nigel Havers was at the performance we saw but past guests have included Sir Ian McKellen, Dawn French, Sting, Ewan McGregor, David Suchet and Roger Moore. I felt uncomfortable to see Havers play a fairly weak cameo role in a weak play. His agents must've been pretty desperate after the flop of 'Manchild'! But it was a nice surprise even if it was a far cry from his performance in 'Chariots of Fire' (incidentally the only time I laughed was when Tony Sedgwick did the impression of him doing the 'champagne on the hurdles' scene from the film in slow motion. It was funny right down to the Vangellis soundtrack blaring away over the top. It was also the only part most of my friends didn't laugh at!) 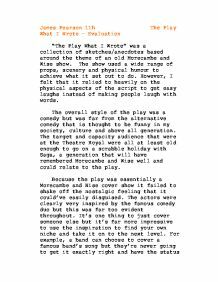 Overall 'The Play What I Wrote' lived up to what it was meant to do and pleased the target audience it was designed for. However, I felt it relied to much on physical props, cheap one-liners, corny punch lines, audience reaction and above all a style of nostalgic dated comedy that is totally out of place on the scene today. 1/10! [A E1] ...read more. Pinter himself spoke of this form as being one of the most pure for the theatre. For Pinter, one room, a few characters, and a door, and the fear of what will come through the door next is all that is necessary for a good play. The Lyon household consisted of a background of pale flowery wallpaper, a large window, one or two pictures on the walls, and nice furniture. The Johnstone house, however, portrayed an over-crowded, small and very cluttered kitchen, with very brightly coloured wallpaper that looked many years old, as bits were damp, scribbled on, or had been picked off of the wall. This I because we felt this was the turning point in the story this is where the real action begun. Because everything from was very emotional, from this point everything became very serious and had me on the edge of my seat. > Even though we were very focussed we weren't like this throughout, we would sometimes come into lesson off task and be chatting amongst ourselves. If we had more focussed we might have got more done and be able to spent more time polishing at the end. These were all used effectively and pushed the actors to a limit. The group were one of many who also decided to not only focus on the restaurant but also in the kitchen. This gave the audience something different to watch and the comical happenings in restaurant kitchens are quite bad!!! Choosing the subject of 'coming out gay' proved to be the wrong situation as it resulted in a comical play all the way through. I would have preferred it if there was an element of seriousness to it as it is an important issue that needs to be addressed. he feel once he has, we empathise with his character understanding his situation: "(with burning fury): For me!... "16 Through the conflict created by Miller the hope for the character relationships strengthens as does our pity for Joe Keller. Is our protagonist a good man who has made a bad decision just for his family?